Today’s presentation will be done by Diana Curtin and Lisa Alexander from the Chops Teen Club. Chop’s Teen Club is an enrichment and prevention based nonprofit organization open to Santa Rosa teens in grades 7-12. Chop’s Teen Club is a supporting organization of the Community Foundation Sonoma County. Charles DeMeo saw a need for a place for teens to call their own in our community, and left a portion of his estate for the realization of his vision. President Mark Burchill rang the bell and Judy Glenn failed to answer the call. I believe I heard Don McMillan’s voice leading in the pledge from somewhere deep in the crowd. Julia Parranto gave a stirring invocation that resulted in appreciative applause from the assembled masses. 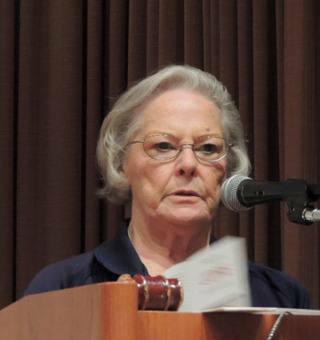 Guests of Rotarians included speaker Iola Beckley. Ray Giampaoli hosted credit and finance man, Erik Lacy. Chiropractor Casey Tucker was hosted by Tim Delaney. Also in attendance were Steven Dunn and Mel Konrad, the wife of our esteemed leader. 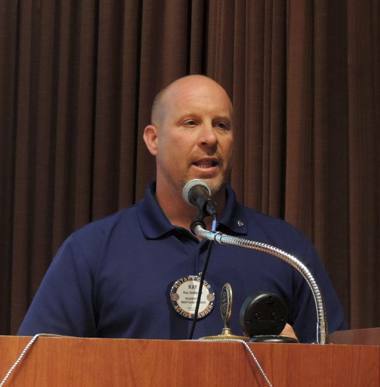 Uh, Ray…..this is Rotary. I think you took a wrong turn on your way to the 20/30 Club! Debi Zaft challenged our club board with today’s Rotarian Magazine question. This week, her question was, ”What is Mr.Levi’s Mighty Soul Sauce and what does it have to do with Rotary?” No board member appears to have read the magazine, so Steve Olson gave us the answer. District 6400 in Detroit has created a microloan business program that enabled this gentleman to start a barbecue sauce business. The Raffle was presided over by our own Casey D’Angelo. Guest speaker Iola Beckley’s number was drawn. She was challenged by President Mark to give definitions of British/American words. Iola skillfully answered two of the three questions asked and walked away with the purse. President Mark reminded everyone of the schedule on their tables of upcoming events including the SCARC meeting. He then auctioned off a pair of tickets to Kris Anderson for the 4H barbecue at Kendall Jackson for $30. Doug Johnson is looking for rest stop volunteers for the Gran Fondo. This is a popular volunteer event and Doug said he only needed to fill one more slot, already having 24 people signed up. If you haven’t volunteered for this before, please join us – you can’t have too many volunteers and it’s a great fellowship opportunity! Ginny Cannon reminded us that Rotary apparel is on sale at the back of the room. Wayne Rowlands announced that advertising for the World Pillow Fighting Championship is ratcheting up. ESPN is scouting the event with possible interest in televising it next year. Wayne is looking for four people to be trained as referees. Any takers? Come on – get down in the mud!!! Yale Abrams was recognized for a lovely photo of his son Dale with his new bride. It seems Yale actually presided over the ceremony. Yale donated $100 to his son’s PH. Rich de Lambert was recognized for his work in Tonga and being honored with a new name: “Fisi Mo Ha’amoa”, which translates to “Warrior”. For three years, Rich has been a warrior working to get dialysis machines into the main hospitals in Tonga. This year, the region sustained a major earthquake and then a hurricane came through and wiped out the main hospital. Rich is also working to help build clinics on the three major islands of Tonga. Rich donated $25 to the club. Layne Bowen was recognized for Redwood Building Maintenance Co. being listed as a Top 10 Company in its field in the North Bay Business Journal. Layne donated $50 to his PH. Finally, President Mark, encouraging bright and flashy sartorial behavior honored Casey D’Angelo for his loud tie, and Ray Dorfman for his blindingly bright shirt. Both received Rotary Bux. 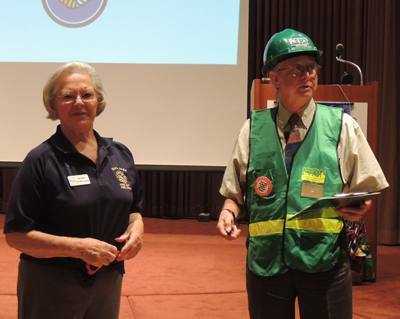 COPE coordinator Iola Beckley and Lee Dibble split time at the podium sharing their thoughts on disaster preparedness. The mission of COPE is to help neighborhoods and individual families to be better prepared to respond to and recover from emergency situations. This includes developing individual and neighborhood response plans, maintaining individual emergency supply kits and outreaching to neighbors. Iola said that the general guideline is to be prepared for up to 7 days without utilities. She and others in the audience shared their stories of the recent Napa earthquake as an example of what can be expected. Interestingly, the most common injury experienced was cut feet from broken glass. Iola advises that we all keep a pair of easy to slip on slippers with a thick sole right by the bed. Other stories of gas and water lines breaking were shared. Those who own rental property are advised to make sure their tenants know how to check for gas and water leaks and how to turn those off if needed. Lee Dibble talked about the need for Ham radio during a time of power failure. He noted that while cell phone service may not be completely knocked out, that over 2,000 Comcast customers in Napa lost their phone lines for an extended period of time. He is working to get Ham radio into all area fire stations as an emergency communication medium. THANKS FOR THE HELP – I COULDN’T DO IT WITHOUT YOU!